Klimt’s muse and art patron, Adele Bloch-Bauer, and Maria Altmann, Adele’s niece, narrate their lives and times in Vienna of fin de siècle and the first half of the 20th century. Klimt’s works of art and the Nazi occupation of Austria with the emotional scars and physical horrors inflicted on the Jewish population—first in Austria and eventually all over Europe—provide the backdrops, as do the Nazis’ thievery of art, wealth and goods. Stolen Beauty has as its subjects the lives of Adele Bloch-Bauer—subject of Gustav Klimt’s portrait “Portrait of Adele Block-Bauer 1”, nicknamed by the Nazis “Lady in Gold”—and of Maria Altmann, Adele’s niece. Maria Altmann is the subject of the 2015 movie Woman in Gold, which chronicles her legal efforts to be recognized as the rightful heiress of the above-named portrait, and recover it after being illegally appropriated by the Nazis during their occupation of Austria in 1938. If you saw the movie, as I did, you probably think you know the story that Stolen Beauty depicts, but it isn’t so. In Woman in Gold, Maria left her parents in Vienna and escaped the Nazis almost by chance, somehow making it to America where she lived until old age. Thus, Laurie Lico Albanese sets on a journey to bring Marie Altmann’s life as a newlywed in 1938, Vienna, her escape from the Nazis with her husband, first to England and then to America, and the dispersion of her brothers to Canada, and her uncle Ferdinand to Switzerland, where he died at the end of the war. Stolen Beauty brings to life fin de siècle, Vienna, the Secessionist art movement of which Gustav Klimt was the most prominent figure, the upper stratus of Vienna’s society of which Adele Bloch-Bauer and her industrialist husband Ferdinand Bauer were indisputable rulers. Furthermore, the novel explores Adele Bloch’s youth as an idealist—with dreams of becoming an educated woman of the world, just as men could—, her friendship with Ferdinand Bauer (her sister Thedy’s brother-in-law), and eventually the marriage that cemented a dynasty. Through the early years of the 20th century, we witness Adele become a woman ahead of her times as she reads philosophy, anatomy, classic literature, and art, and host salons for intellectual discussions about modernity. Of particular interest to Adele is the Secessionist art movement; she becomes Klimt’s patron, friend, and, according to Lico Albanese, much rumored lover. Adele’s friendship and patronage would spark Klimt’s critically acclaimed and much celebrated golden phase. In return, Klimt would awaken in young Adele a fiery sexual goddess. 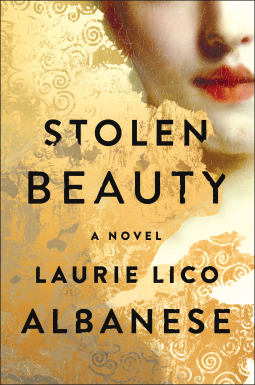 Stolen Beauty, in case you haven’t discovered, has a dual narrative: Adele’s and Maria’s. It also includes, in italics, separate sections that focus on tidbits about the eras, and their personages. I had a hard time trying to forget what I knew from the movie Woman in Gold since both narratives are in disagreement, thus I think the novel can be best enjoyed if one has no previous exposure to the characters; that said I liked Stolen Beauty very much. The only thing that nagged somewhat was Adele and Klimt’s entanglement; I thought it was deceitful. Stolen Beauty is a novel of art, love, loss, courage facing insurmountable odds, and sexual desire and awakening. It is also an exploration on marriage, faithfulness, and fulfillment as an individual within a marriage; it is a novel on promises broken, haunting memories, and finally, about redemption and the power of family. In all these counts, Stolen Beauty succeeds. DISCLAIMER: I received from the publisher a free galley of this book via NetGalley in exchange for an honest review. This sounds like a fascinating mix, well worth reading. I just heard about this book today! I did not know it was connected with the movie. I have always loved Klimt's art. If I was disgustingly rich I would try to buy one of his paintings. In 2005 I read a novel about one of his other women (he was quite the womanizer it seems) called The Painted Kiss. http://keepthewisdom.blogspot.com/2007/12/painted-kiss.html I would like to read this and then see the movie. Womanizer indeed! He had thirteen or fourteen children. The Kiss is one of the works discussed in Stolen Beauty; it is also from his golden phase. Allegedly, Adele is the subject in the painting, as she was in Judith Slaying Holofernes, and two portraits commissioned by the Bloch-Bauers. The Judith was an allegory but it was her face. You commented on Judith's story not long ago in one of your posts, and when I read about the allegory in Klimt's painting, I said, aha! Yeah I saw the movie Woman in Gold and liked it; so this book seems to add to what is in the movie with Adele's narrative, right? But how does it disagree with it? You mean Maria Altman's life in the movie is over-simplified whereas it was much more complex than that -- as depicted in this book. thx. very interesting topic, and life stories. It was not just oversimplified but different. Even the events surrounding the trial were slightly different from the movie, though not in remarkable ways. What a fascinating review. Funnily enough I have seen the movie and I enjoyed it so it's interesting to read your thoughts here having read and seen both - I'm going to assume you preferred the book? Given that I've seen the movie would it be a bit difficult to read it now do you think? I was offered this book because I am an unconditional fan of Gustav Klimt's works. This book is on my shelf waiting to be read. If you are a fan of Klimt's works, I think you will like this book. It did him justice.